Sure, it’s easy to install WordPress and upload a theme. But what happens next? Why not make this first impression blow the user away, offering a simple, intuitive, and clever interface to help them get started? Merlin WP (GitHub) is my stab at addressing the tedious and exhausting WordPress theme setup and onboarding process. It makes installing a new WordPress theme, its recommended WordPress plugins, Customizer settings, widgets, and demo content, an exciting and gratifying user experience. A while back, David Bakercreated a clever setup wizard class (Github), inspired by the WooCommerce welcome wizard. While it’s a solid move in the right direction, I wanted to build an onboarding wizard that was even more refined. So I did. And while I originally developed Merlin WP as a side-project to exclusively include in my own theme catalog, I soon pivoted and committed to building the class to be easily deployed within most WordPress themes. How does Merlin WP work? 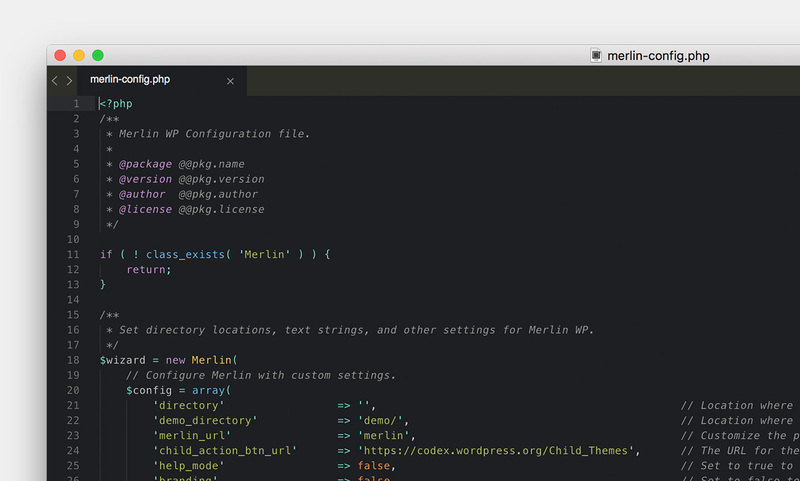 I’m building Merlin WPto be added directly into theme files. Once added, you need to include the class, the merlin-config.php file and then your own demo content files (content, widgets & Customizer data). The configuration file makes it easy to customize any text string throughout Merlin WP, as well as set the class directory and demo content locations. And if you have TGMPA included in your theme, Merlin WP will “just work” with it, pulling the recommended plugins right into the wizard. I’m also working in support for EDD Software Licensing, which I use to power my own WordPress shop, so that users can activate their license key during the onboarding phase. So why did I build Merlin WP? There are a few WordPress plugins currently available, such as One Click Demo Import (OCDI), which import content well, but leave the user experience with quite a bit of room for improvement. Even with an OCDM compatible WordPress theme, the user is required to install OCDI (likely using TGM Plugin Activation), navigate to the OCDI admin page, and thenrun the importer. But wait, let’s backtrack to TGMPA. Now there’s another process added to the mix. The user needs to perform a plugin install and activation process to get any other recommended WordPress plugins ready to go. Sure, TGMPA makes the process of downloading, installing, and activating plugins simple-ish, but it has a convoluted approach that is not particularly user friendly. And let’s not forget, any custom post type plugins not installed — will not be imported. Now, if your theme is not compatible with OCDI (or any other importer), then the process is compounded extensively. You’re locating XML files, installing and running the WordPress importer, Customizer Export/Import, and Widget Export/Import plugins, and then setting the home and blog pages. That’s not easy for anyuser, not just beginners. When will Merlin WP be available? I’m working on the finishing touches, EDD Software Licensing support and a few odds and ends, but I’m shooting for the end of August. I’ll be reaching out about beta testing Merlin WP as well, so if you’re interested click here to subscribe. Edit: The beta is up on GitHub! Hit me up on Twitter, or email me directly if you have any questions!